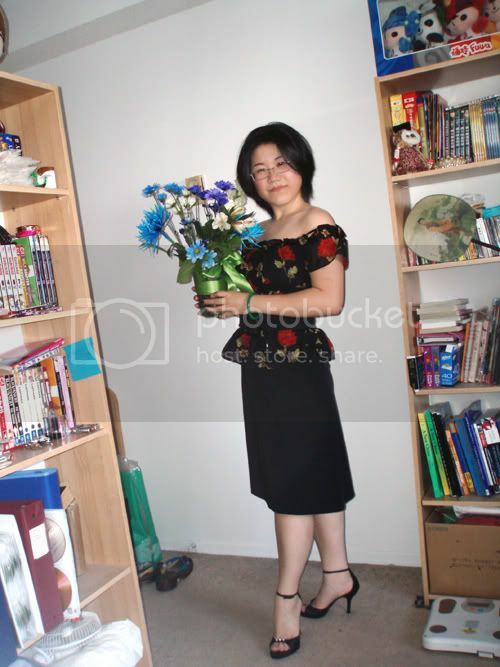 Mengya's got flowers and no vase to put them in (not even a tall enough jar or something)...I feel so student-y XDD Just a few bowls, plates, forks, knives and chopsticks in the kitchen (along with tons of plastic containers from take-out meals lol). 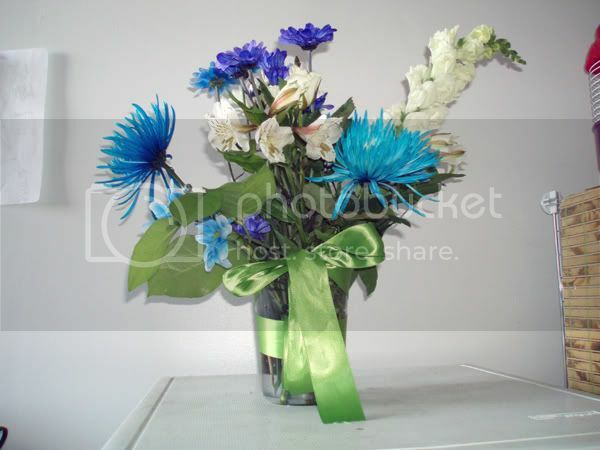 [EDIT]: Here we go~ Found one of those pre-mentioned plastic containers and spruced it up with a ribbon for the flowers. This was a mini-top hat (it's actually a doll's top hat) that I added some fake pearls, feathers and flowers to, you should see the looks I get when I walk outside with it on, lol. Wagh. Your outfit is adorable, Mengsie. Did you lose weight? :O No offense, you just look skinnier than I remember. And Really Bloody Cute. ;; That haircut! :O! I want to lose a few more pounds still, I think for my height (5'1") 100lbs-130lbs is the average, healthy range. 125lbs nudges up to 130 pretty easily if I'm not careful (ie. after eating a big meal) so I'd like to get it down to 110lbs, that way for times like the winter, Christmas, etc., etc. even if I gain a few pounds I have the buffer, lol. Wow, I like both outfits, but the rose shirt with the belt and pencil skirt looks so good! Hey girl! Looking good ;) Haven't seen you blog for a while now. Glad to see that all's well and dandy with you ^___^ Cheers!! I knooo~w, I've been so awful with updating, which is actually quite amazing because it used to be that I would update every single day, then it lingered to once a week or so, and now it's even less >__< My life's so boring...there's nothing exciting to update ;__; It wouldn't even be so bad if I can get a job, make some money, buy a bunch of 'Zuka shinies and come online to fangirl it everyday for a month or something XDD Nowadays I'm forcing myself not to go onto the 'Zuka website because as soon as I do my 'want list' gets longer and longer and longer and longer. Wahhhhh, your outfits are so awesome! & you look fantastic! OMGGGG YOU'VE LOST A LOT OF WEIGHT, HAVEN'T YOU?!!! !